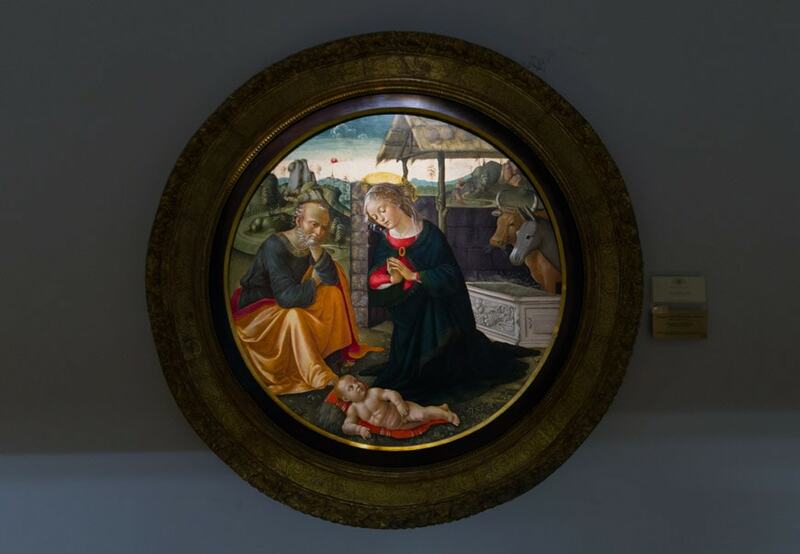 The Biblioteca Ambrosiana in Milan is a historic cultural institution and library which also houses an exceptional museum of art, the Pinacoteca Ambrosiana, with works by Leonardo, Botticelli, Ghirlandaio, Caravaggio, and Bruegel the Elder, among others. 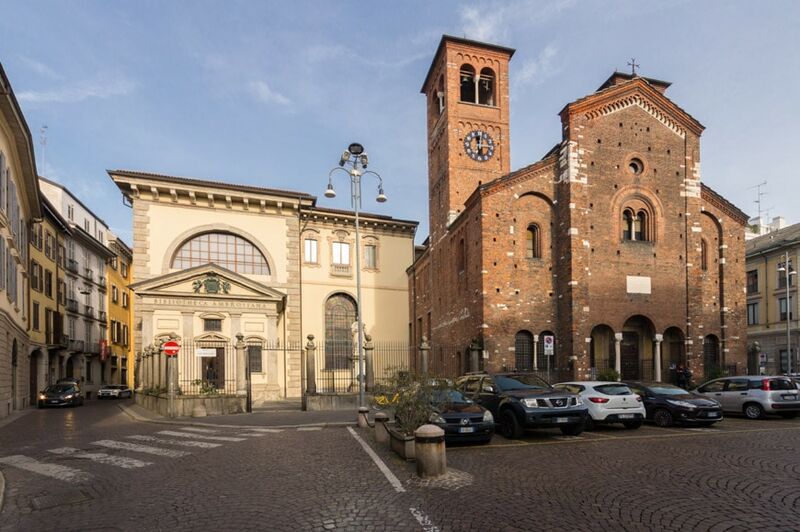 The Biblioteca Ambrosiana (Ambrosian Library) is named after Saint Ambrose, the patron of Milan, whose name originated the adjective Ambrosian, which has been widely used historically as a synonym of Milanese (of Milan). 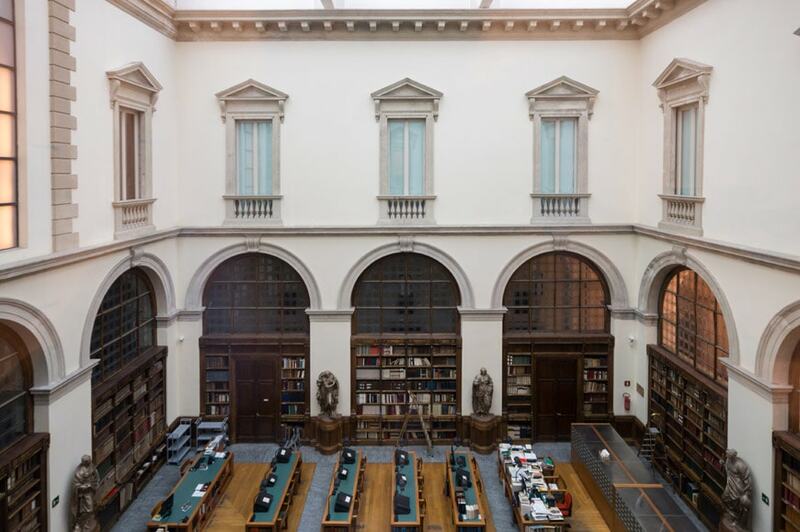 The Biblioteca was founded by Cardinal Federico Borromeo in 1607 with the aim to make a large number of manuscripts, books, incunabula, drawings and prints from his collection available “to all who can read and write”. The library collection also includes over one thousand leaves of the world-famous Codex Atlanticus by Leonardo da Vinci. Located in the Ticinese neighborhood, not far from Piazza del Duomo, the Ambrosiana Palace was built in the early-17th century, possibly after a design by architect Francesco Maria Richini, and subsequently modified in the first half of the 19th century by Giacomo Moraglia, who also designed the building’s Neoclassical facade on Piazza Pio XI square. While the exteriors of the palace are rather simple, the interiors are richly decorated and include a monumental stair, a porticoed courtyard overlooking the apse of the church of San Sepolcro, and a sequence of rooms ornamented with sculpted wood paneling, stucco decorations, and mosaics. 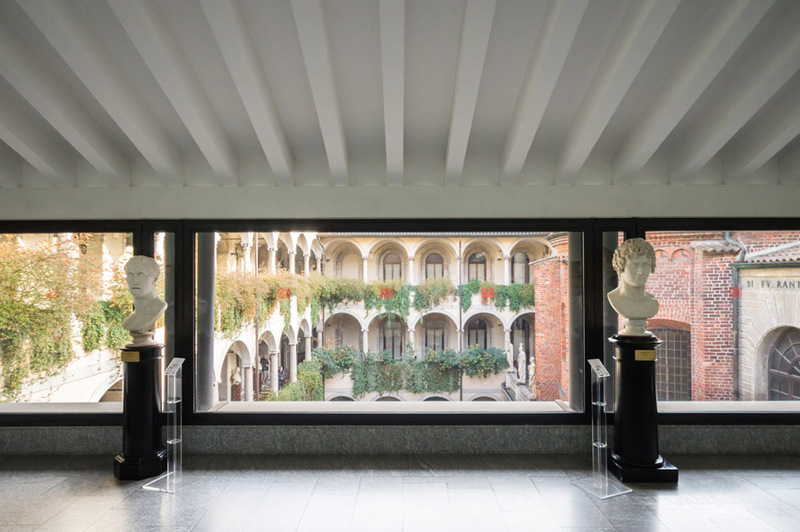 The architecture of the lecture hall of the library is rather linear, instead; it was created in 1923 by Ambrogio Annoni, who covered an internal courtyard and converted it into a large room. 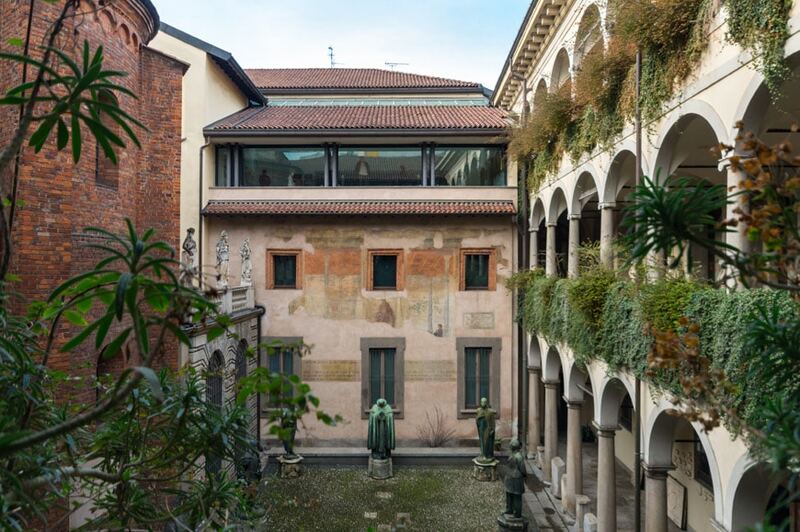 The courtyard of the Pinacoteca Ambrosiana; photo © Riccardo Bianchini / Inexhibit. 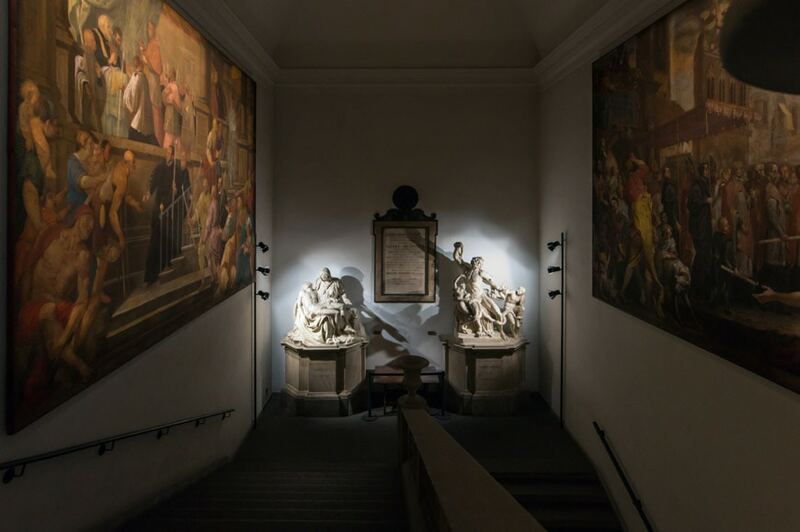 The monumental stair of the Ambrosiana Palace, with two 16th-century plaster casts of the Pietà by Michelangelo and of the Hellenistic sculpture of the Laocoön and His Sons; photo © Riccardo Bianchini / Inexhibit. The reading room of the Biblioteca Ambrosiana; photo © Riccardo Bianchini / Inexhibit. 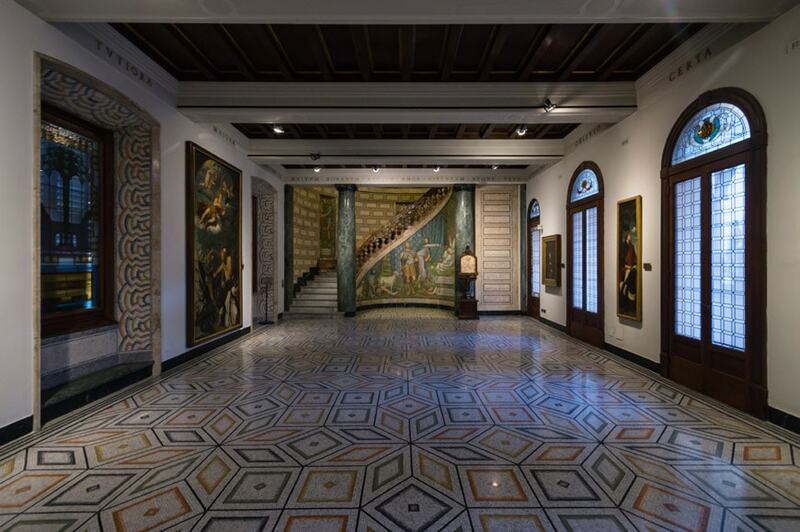 Interior views of the Pinacoteca Ambrosiana art gallery; photos © Riccardo Bianchini / Inexhibit. 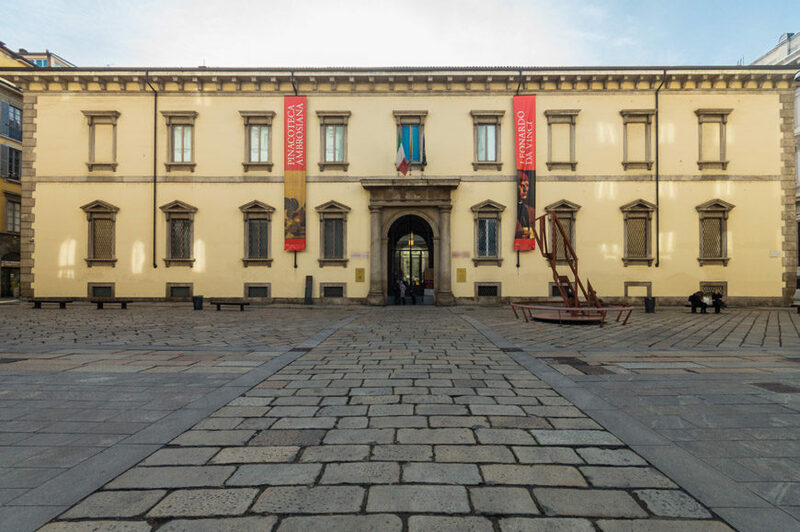 The Pinacoteca Ambrosiana was founded by Federico Borromeo, eleven years after the library, to educate people to art by the means of paintings and sculptures donated by the Borromeo family; the collection was subsequently enlarged through donations and bequests. 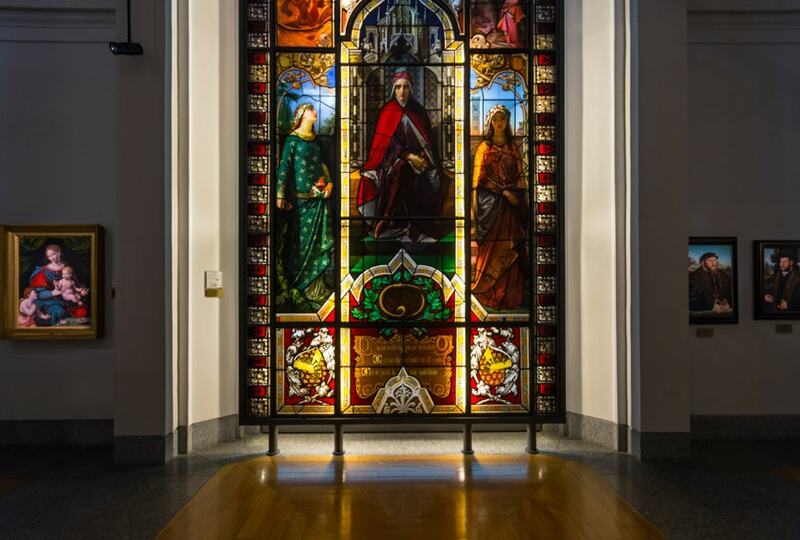 The artworks of the permanent exhibition are displayed in 24 rooms, distributed on three floors, in chronological order, from the Renaissance to the early 20th century. 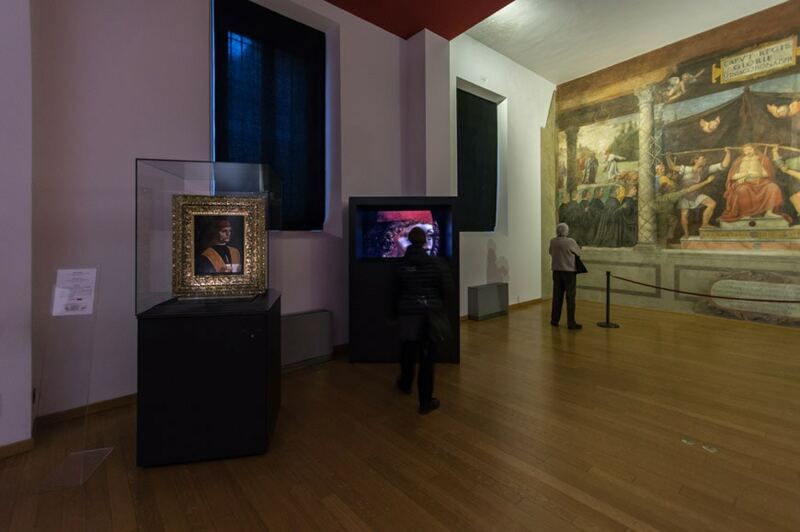 The rooms on the ground floor at the end of the exhibition, which make an exception to the chronological sequence, accommodate two of the most important paintings of the collection – the Portrait of a Musician by Leonardo da Vinci, and the Basket of Fruit by Caravaggio – indeed. The rooms on the first and second floors house notable works by Titian (Adoration of the Magi). Botticelli (Madonna del Padiglione), Raphael (cartoon for The School of Athens), and Domenico Ghirlandaio (Adoration of the Child), to name a few. The permanent exhibition also includes a truly remarkable series of landscape paintings by Jan Bruegel the Elder, and a number of beautiful portraits by Francesco Hayez. 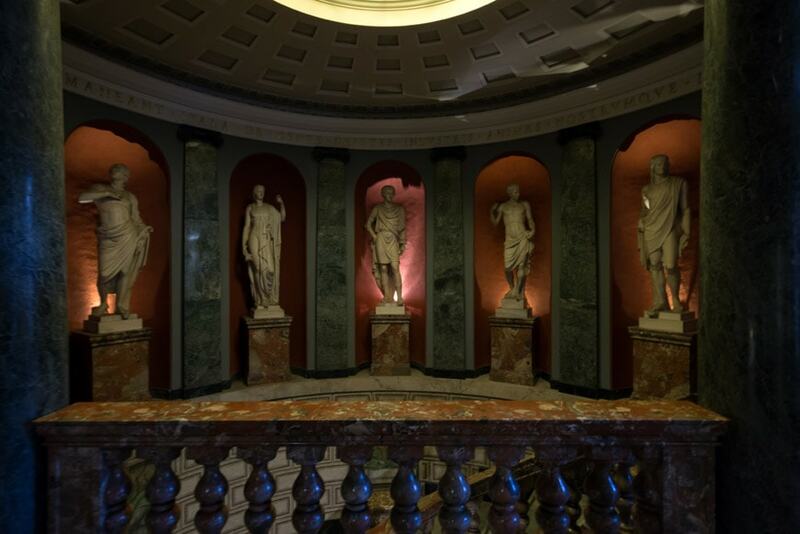 The artworks on view are exhibited together with historical artifacts (such as the gloves Napoleon I was wearing at Waterloo), ancient scientific instruments, exotic specimens, and objects of decorative and applied arts, thus reproducing the original “encyclopedic” layout of the gallery conceived by Cardinal Borromeo in the 17th century. 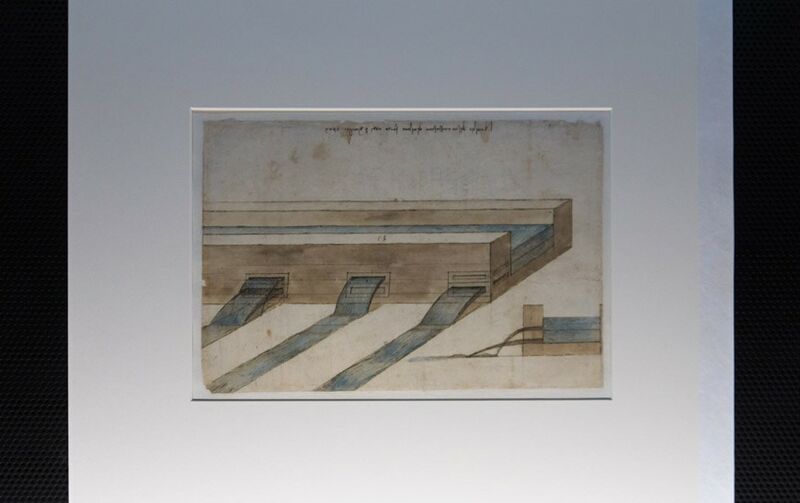 On special occasions, the gallery also exhibits some of the leaves of Leonardo’s Codex Atlanticus. 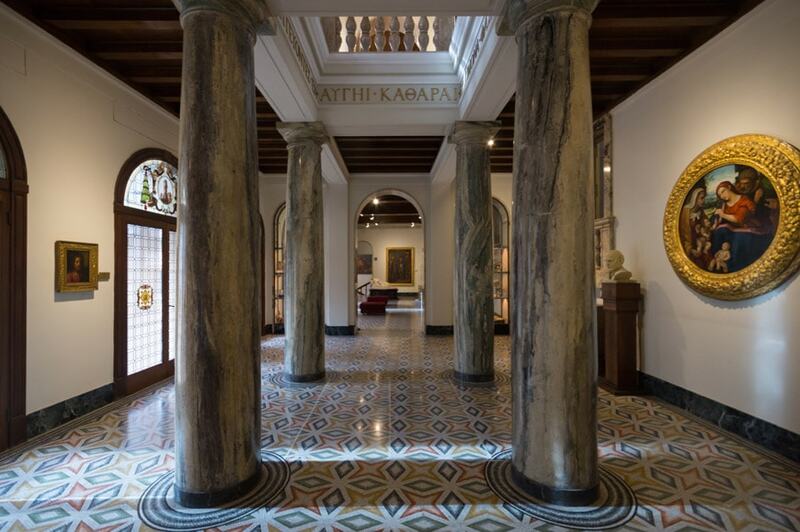 The Pinacoteca Ambrosiana also contains a bookshop and organizes temporary exhibitions and educational workshops, especially aimed at children and schools. 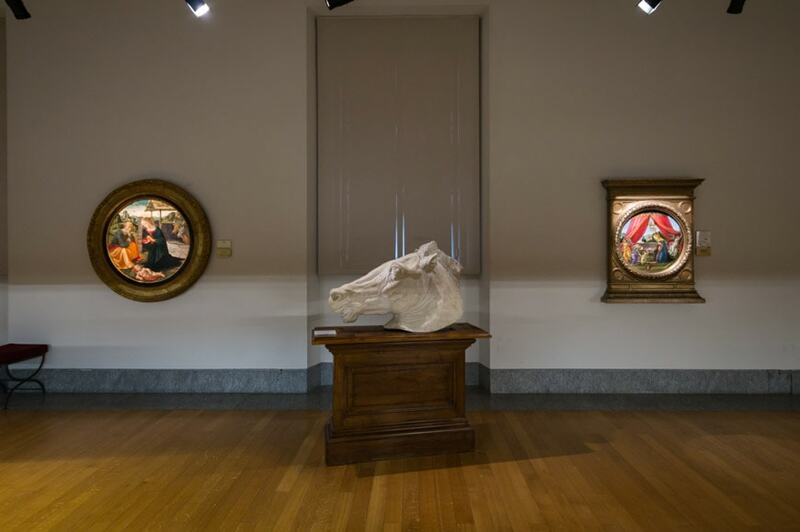 One of the permanent exhibition rooms with a plaster cast of a horse head from the Equestrian Statue of Marcus Aurelius in Rome, and two paintings by Domenico Ghirlandaio (on the left, detail below), and by Sandro Botticelli; photos © Riccardo Bianchini / Inexhibit. 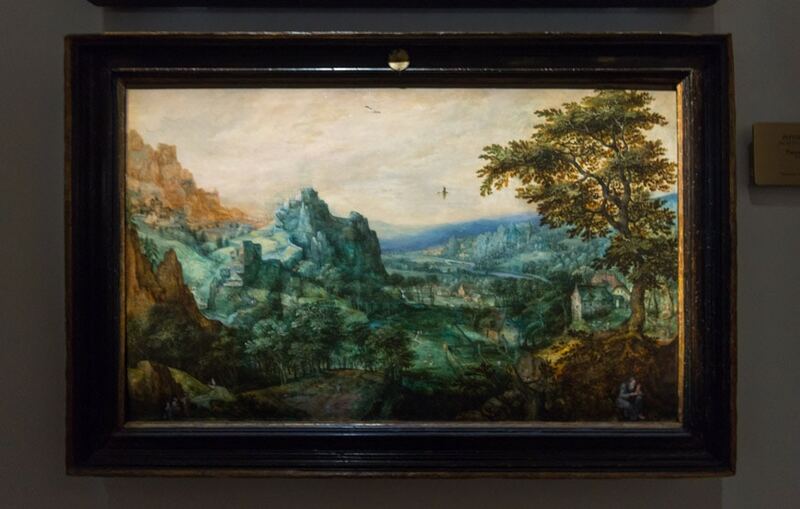 A landscape painting by Jan Bruegel the Elder; photo © Riccardo Bianchini / Inexhibit. 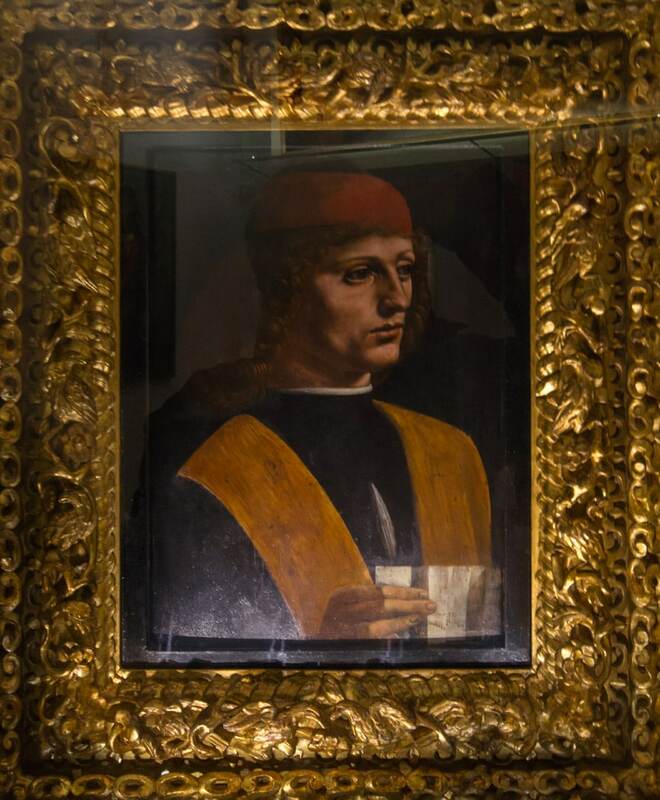 Leonardo da Vinci, Portrait of a Musician, 1485, oil on wood panel; photos © Riccardo Bianchini / Inexhibit. 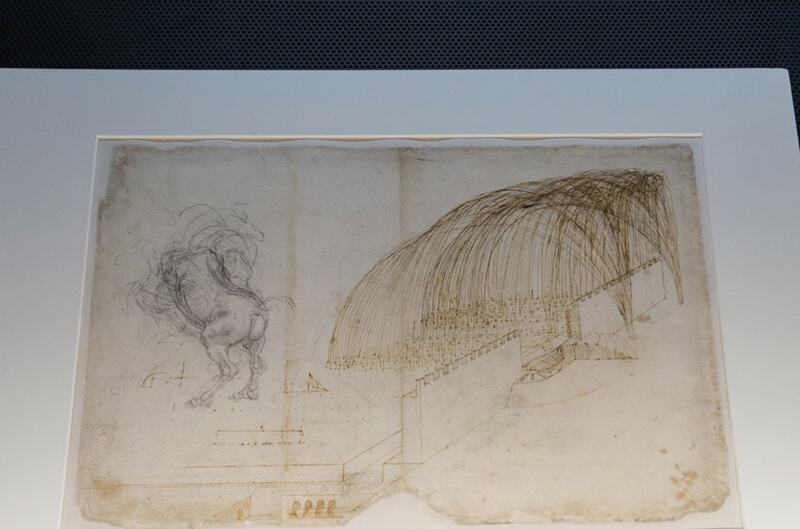 Leonardo da Vinci, two drawings from the Codex Atlanticus; photos © Riccardo Bianchini / Inexhibit. 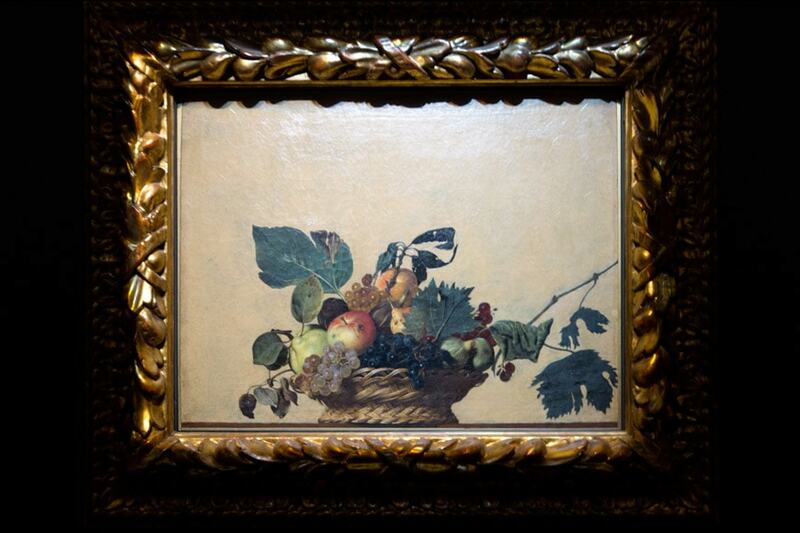 Caravaggio (Michelangelo Merisi), Basket of Fruit, c.1599, oil on canvas; photo © Riccardo Bianchini / Inexhibit.